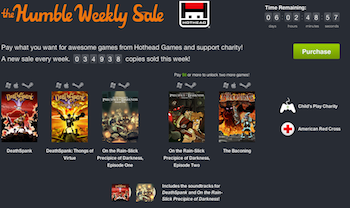 The latest Humble Weekly Sale features Hothead's off-kilter RPGs, all for charity. Lets face it: games can be pretty grim today. It's all burly men gripping their weapons with fierce determination, helpfully rendered in a washed-out color to remove every other emotion. If they're getting you down, don't despair: funny games do exist! And not just the inadvertent humor you find in GTA 5's wanton destruction either! This week's Humble Weekly Sale showcases the odd-ball RPGs from Hothead's library, which will let you grab a handful of less-than-serious titles and donate to charity at the same time. This week's selection of games comes from two series: Deathspank and Penny Arcade. The former centers around the grand Dispenser of Justice himself, Deathspank, as he quests around a pop-up book world and battles everything from Savage Unicorns to Bearlopes. The sale includes both the original game and the sequel, The Thongs of Virtue. On the slightly-less-over-the-top side, there's Penny Arcade's On the Rain-Slick Precipice of Darkness, Episode One, which tosses the webcomic's pliable characters into an eldritch investigation. If nothing else, it should teach you to fear feral hobos and weaponized mimes. The above games are yours for any donation above $1. However, a donation of at least $6 lets you continue the series with Precipice of Darkness, Episode two and The Baconing. As usual, you'll receive a Steam copy of each game. They all work on the PC, but the Deathspank games also have Mac versions available. While sales like these often like to tout their charity-generating abilities, the default settings send most of the cash back to Hothead, so keep that in mind when deciding how to share your wealth.